We are offering or providing Organic Alovera Fiber Juice. Aloe Vera Fibre Juice Juice contains all the natural benefits of the aloe Vera and the great taste of the alovera.Minerals - aloe Vera contains copper, calcium, selenium, chromium, magnesium, potassium, manganese, sodium and zinc. vitamins - vitamin a, c and e are all contained within aloe Vera and function as antioxidants which help remove free radicals from a person's system, other vitamins include b12, choline and b9 (folic acid). 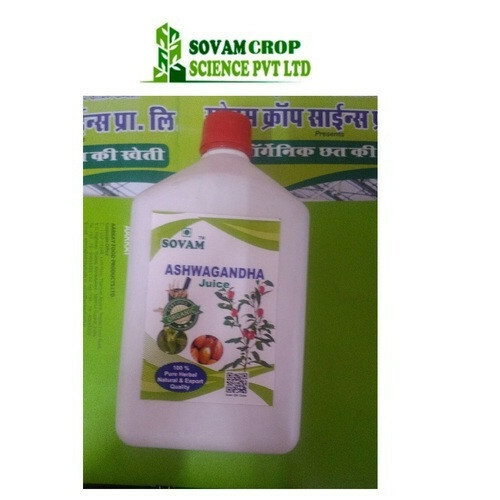 Use 15-30 ml twice a day within diluted 100 ml..
Sovam Nirgundi Juice 500mlis very useful herb in morbid conditions of vata like epilepsy, insomnia and vertigo since it works as a brain tonic. It is most useful for inflammatory conditions like tonsillitis, endometriosis and orchitis. It has anticonvulsant, antioxidant, and bronchial relaxant and hepatoprotective activities. We offer a wide range of products which include Organic Gooseberry Juice, 30ml Panch Tulsi Drop, Amla Juice, Black Plum Juice, Concentrated Nano Drops and Herbal Juice For Obesity. We are one of the prominent name in this field of offering wide range of Ayurvedic Herbal Ras to our clients. We hold expertise in formulating and supplying Ayurvedic Herbal Ras, an effective ayurvedic medicine that has multiple health benefits. Hygienically prepared using natural and pure herbs, it has high medicinal values and is good for eyes, skin and heart. Herbal Aloe Nutrilife Juice. These are formulated as per the industry parameters using pure quality ingredients and latest technology. Additionally, these are rich in minerals such as manganese, zinc, iron, calcium, sodium, and potassium. We are offering or providing Stevia Alovera Juice. Stevia Alovera Juice contains all the natural benefits of the aloe Vera and the great taste of the Stevia. Minerals – aloe Vera contains copper, calcium, selenium, chromium, magnesium, potassium, manganese, sodium and zinc. vitamins – vitamin a, c and e are all contained within aloe Vera and function as antioxidants which help remove free radicals from a person’s system, other vitamins include b12, choline and b9 (folic acid).